Think globally, suffer locally. This could be the moral of “Methland,” Nick Reding’s unnerving investigative account of two gruesome years in the life of Oelwein, Iowa, a railroad and meatpacking town of several thousand whipped by a methamphetamine-laced panic whose origins lie outside the place itself, in forces almost too great to comprehend and too pitiless to bear. The ravages of meth, or “crank,” on Oelwein and countless forsaken locales much like it are shown to be merely superficial symptoms of a vaster social dementia caused by, among other things, the iron dominion of corporate agriculture and the slow melting of villages and families into the worldwide financial stew. The book, wrought from old-fashioned shoe-leather reporting of a type that’s disappearing faster than nonfranchised lunch counters on Main Street, isn’t chiefly a tale of drugs and crime, of dysfunction and despair, but a recession-era tragedy scaled for an “Our Town,” Thornton Wilder stage and seemingly based on a script by William S. Burroughs. The madness stalking tiny, defenseless Oelwein may eventually come for all of us, we learn, and once again, as happens in America whenever our collective attention wanders from the gray struggles of the little guy to the purple capers of the big wheels, attention must be paid. Right now. Or else. “Methland” begins quietly and solemnly, with a ballad of cultural invisibility. Reding, a loyal native of the Midwest who’s frankly sentimental about its past and starkly lucid about its likely future, invites his rushing readers to gaze down at the “flyover country” of America and see not a grid of farms and county roads but a patchwork of failed institutions and aspirations. There’s the hospital, groaning under a load of uninsured patients with ­minimum-wage jobs and maxed-out household budgets. There’s the school, imperiled by dwindling tax receipts and students with ever more grown-up problems. And there, on a street in a district of drab houses not far from the faltering central business district, is a passel of latter-day Tom Sawyers on bikes, riding along not for the summertime heck of it but to shake up batches of low-grade speed contained in plastic soda jugs lashed to their back fenders. It’s magnificently potent stuff, this meth, whose crudest versions are concocted from a mash of over-the-counter cold pills and flesh-eating bulk industrial chemicals. Just a few grains of it, snorted through scarred nostrils and allowed to saturate stressed synapses, can keep a person awake and going for days. And that’s not an entirely bad thing here, where survival means working harder for less each year, from late shift to day shift, until perception blurs. Manning another fortress against the siege is Dr. Clay Hallberg, Oelwein’s leading physician and a chain-smoking, trembling alcoholic who likes to swill cheap canned beer in his garage. Oddly, like Lein, he’s an amateur philosopher, given to quoting Kant and reading Chomsky and trying to fit his hometown’s woes — ghoulish orgies of domestic violence, toxic explosions of backyard crank labs, psychotic episodes at Do Drop Inn — into overarching historical patterns. He and Lein share a longing, perhaps even a mania, to achieve an enlightened perspective on decline, if only because it lifts them temporarily out of their harsh grass-roots struggle with its effects. 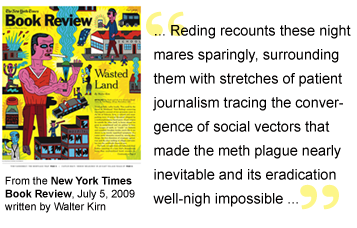 Too many scenes of sulfurous agony might chase away the most calloused, ambitious reader, so Reding recounts these nightmares sparingly, surrounding them with stretches of patient journalism tracing the convergence of social vectors that made the meth plague nearly inevitable and its eradication well-nigh impossible. He details, with blunt statistics and apt anecdotes, the vanishing of educated young males from rural Iowa, as well as the butchering of middle-class jobs at the local packing plant. The agricultural conglomerates that have gobbled up Oelwein and similar farm towns may feed the world, but they starve the folks who work for them, breeding a craving for synthetic stimulants that conveniently sap the appetite while enlarging the body’s capacity for toil. These offal-streaked Dickensian mills are also magnets for desperate immigrant laborers who, in some cases, blaze the smuggling trails that run up into the Corn Belt from Mexico, home to the gang lords who own the superlabs that, increasingly, dominate the meth trade. “Vicious cycle” is not an adequate term. As Reding painstakingly presents it, the production, distribution and consumption of methamphetamine is a self-catalyzing catastrophe of Chernobylish dimensions. The rich, with their far-off, insulated lives, get richer and more detached, while the poor get high and, finally, wasted. In the meanwhile, the traffickers fatten in their dens, expanding their arsenals and their private armies, some of whose troops are recruited from the ranks of the pale zombies their business spawns. A photon of cheer at the end of this grim tunnel emerges toward the end of “Methland” when, thanks to tireless efforts by a new mayor, a shaky economic revitalization succeeds in sprucing up the town and brightening its prospects. At the same time, the embattled Lein and Hallberg manage to pull themselves up by their own bootstraps just as they’re about to plunge over sheer emotional cliffs. How all are faring in the current downturn isn’t revealed, and perhaps that’s for the good, because readers who’ve followed Reding into the underworld deserve a measure of hope for their devotion. What’s clear is that the golden rolling heartland that Americans used to think symbolized stability beats fitfully and irregularly still and almost certainly remains inclined to seek out sources of chemical optimism. And no one, least of all Reding, who knows what’s what on an intimate, human level as well as on the astral plane of globalism, can tell us where it will all end — only that, all things being equal in an increasingly unequal land, it doesn’t have far or very long to go. Walter Kirn, a frequent contributor to the Book Review, is the author of “Lost in the Meritocracy: The Undereducation of an Overachiever.